A common perspective on North American environmental history is that the earliest European explorers and settlers entered “pristine” environments little affected by prior human impact. Recent research and an ever-increasing body of information on how Native Americans interacted with their surroundings over the past 15,000 years has overturned that view. In Arkansas and the Mid-South, ancient communities engaged in a variety of activities—food-producing practices, earthwork construction, and vegetation clearing, among other actions—that created “anthropogenic” or humanly managed habitats. In many cases, traces of those habitats remain visible today. Figure 1. Terrain model for the Lee Creek Unit showing ten landform classes. In October 2002, the U.S.D.A. Forest Service convened a symposium on Upland Oak Ecology at the University of Arkansas in Fayetteville. Participating Arkansas Archeological Survey (ARAS) staff discussed the history of land use practices in the Lee Creek Unit of the Ozark National Forest, based on collaborative research carried out by ARAS and Ozark-St. Francis National Forest personnel (Lockhart et al. 1995; Harmon et al. 1997). In view of the continuing relevance of our findings, we offer here a condensed review in celebration of Earth Week 2018. This article is based on the longer version in Spetich (2004). The Lee Creek Unit of the Ozark National Forest covers approximately 404 km2 (156 mi2) in the Boston Mountains province of the Ozark Plateau. Narrow V-shaped valleys bordered by steep slopes and vertical bluffs rise from clear, gravel-bedded streams. Flat ridge tops separate adjacent valleys. The vegetation today is upland hardwood dominated by oak and hickory with scattered pine and brushy undergrowth. Valley bottoms are less than a kilometer wide, with thin, rocky sediments and narrow bands of moderately fertile soils capable of supporting low-density crops. Figure 1 presents a model of the study area. The oldest archeological sites in the Lee Creek Valley date to about 12,000 years ago, representing small groups of mobile Paleoindian hunters and gatherers occupying a spruce-jack pine boreal forest in transition to the oak-hickory forests common to the region in subsequent millennia. Populations slowly increased as expanding deciduous forests provided increasing resources, including acorns and nuts along with several species of nutritious seed-bearing plants. The largest Native American populations developed between 5000 and 500 years ago. The majority of archeological sites in our study unit date to that period; these include rock shelters, other special purpose sites, and larger village sites located within the valley bottoms. Villages were occupied year-round, and by 5000 years ago interaction with invasive plants attracted to open, disturbed habitats surrounding villages led to the domestication of several species including lambs-quarters, little barley, knotweed, sumpweed, and several varieties of squashes. Around 1000 years ago, residents also began to cultivate corn that had been domesticated a few thousand years earlier in Mexico. Our examination of past land use practices centered on three activities: 1) timber harvest for construction; 2) firewood collecting; and 3) field clearing for raising crops. From excavations of dwellings at archeological sites in the Ozarks, we learn that wall posts were made of hardwoods such as red oak, white oak, and hickory, typically 10–30 cm in diameter. Dwellings average 4–8 m on a side, requiring about 50 stems for the walls and half again as many for roof timbers, interior roof supports, and interior bench supports. Samples of wood charcoal collected from hearths reveal preferences for oak, sycamore, pine, hickory, and maple. Gardening and field agriculture created needs for cleared areas, possibly in excess of land cleared for timber harvest and firewood collecting. We turned to historic accounts of Osage land use practices to develop models of ancient land use as a guide for the archeological analysis. Historic Osage communities provide useful analogs because they engaged in all three of these activities within comparable environmental settings. Early 19th century observers confirm that wood, water, and fertile soils were important factors in settlement location choices. In 1819, Thomas Nuttall wrote that “… river lands are no less extensive and luxuriant between the Verdigris and the Arkansa, and would apparently support a condensed settlement; but the prairies will only admit of settlements along their borders, in consequence of a scarcity of wood and water” (Nuttall 1999:211–12). Victor Tixier described an Osage village he visited in 1839: “Hunting lodges had been erected in a bend of the stream. Water and wood were near at hand” (McDermott 1940:159). To quantify wood consumption and land clearing requirements, we need to estimate village populations. Here again, historical sources provide guidance. On December 30, 1819, Henry Rowe Schoolcraft visited recently abandoned hunting camps along Swan Creek in southwest Missouri. Schoolcraft described these camps as “all very large, arranged with much order and neatness, capable of quartering probably 100 men each” (Rafferty 1996:78). Using a conservative 1:4 ratio of hunters to overall population, we estimate a group size of 400 individuals per camp. A similar contingent of Little Osages encamped near Fort Osage along the Missouri River were living in 60 lodges “circular in form, not more than ten or fifteen feet in diameter” when they were visited in 1811 by Henry Marie Brackenridge (Brackenridge 1814:217). These numbers suggest that each family of 4–8 members occupied its own lodge. The total floor area of those lodges, estimated at 480 to 985 square meters, could be accommodated at village sites identified in the Lee Creek study area. Figure 2. 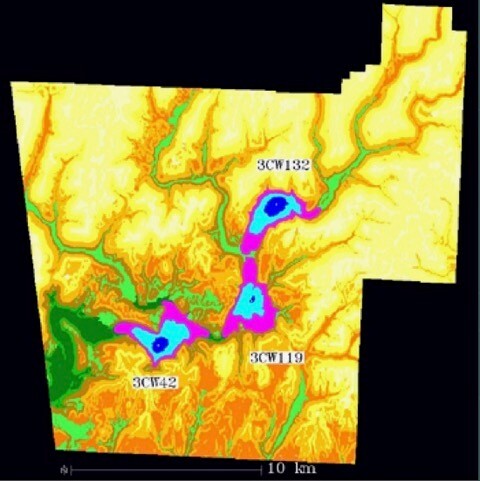 Catchment areas for three archeological sites in the Lee Creek Unit calculated in relation to travel cost surfaces. Lee Creek is smaller than the Verdigris and Missouri rivers along which Nuttall’s and Brackenridge’s observations were made, so we need to modify the 400-person estimate of village size. For the early historic era, population density estimates range between 0.05 and 0.64 persons/km2 (Guyette et al. 2002); this translates to about 20 to 259 people in the Lee Creek Unit. Modern administrative units, however, do not represent Native American settlement territories. 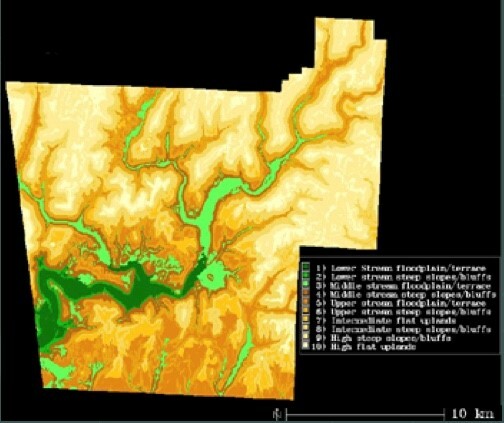 The larger Lee Creek watershed is a better analytic unit. Furthermore, the Native American occupants of that area also made seasonal visits to other areas, such as the prairie-plains region to the west, for activities such as buffalo hunting. Thus, our study area probably was home at any particular time to several extended families whose total population size did not exceed 400. This population undoubtedly was distributed among several settlements spaced in relation to resource distributions and preferences for social interaction. The number of archeological sites representing villages in our study area (n=14) is consistent with a resident population of perhaps 250 people, considering the likelihood that no more than three or four of those sites were occupied at any single time. What was the annual timber consumption of this community? Unfortunately, our otherwise keen observers of 19th century Osage village life fail us on this question, necessitating an appeal to other sources. Robert Heizer’s (1963) calculation of 83 pounds of wood per family per day for Native Americans living in northern California (where comparable annual temperature ranges prevail and where hardwoods were likewise the major fuel source) provides a yearly per capita figure of 2.3 tons that seems reasonable for our study area. From this, the annual firewood requirement for 250 people is about 575 tons. Using U.S.D.A. figures of ten cords of mixed hardwood per acre and with each cord weighing about 1.5 tons (Graves 1919), our 575 tons represents the timber resources of roughly 38 acres. How much wood was required for construction and for manufacture of other items? If each dwelling required about 75 stems, then the 40 structures required to shelter 250 people would consume about 3,000 stems. Using modern figures from the Lake Winona Research Natural Area in Arkansas, timber of 10–30 cm diameter in this quantity would clear an additional 12–15 acres at 250 stems per acre, more or less (Fountain 1991). These structures, however, would not need to be replaced every year. French colonists at Arkansas Post complained in the early 18th century that wall posts set into the damp, frequently flooded sediments of eastern Arkansas had to be replaced every 8–10 years, so we can estimate that the wall posts of structures built along Lee Creek would last at least that long. Even with additional timber requirements for ancillary structures, dugouts, and other items, the total quantity of timber required for construction and manufacturing represents but a small fraction of the annual firewood requirement. We therefore decided not to augment the 575-ton figure, choosing instead to accept that amount as a conservative estimate of total annual wood needs for all purposes. The area of Ozark forests impacted by this magnitude of wood harvest can be calculated by what we refer to as site catchment analysis. An occupied settlement has a surrounding “catchment” from which residents harvest resources like firewood. The overall dimensions of site catchments are usually set in relation to the maximum distance people are willing to travel to acquire those resources. Our early observers did not provide exact figures, but in 1819 Thomas Nuttall accompanied an Osage hunter “about 9 or 10 miles over the alluvial lands of the Grand river” (Nuttall 1999:211). They were not burdened by heavy loads of firewood, but it would be unwise to underestimate Osage fortitude and endurance. Even so, it seems unlikely that the range for firewood collecting would have extended beyond one-third of the range of fast-moving hunters. A 5 km catchment area surrounding each village seems reasonable, and is consistent with worldwide ethnographic data on human foraging ranges. A second issue concerns the overall shape of the catchment area. Most applications use a “concentric circle” approach, which assumes that a person can move with equal ease in every direction. That is not the case in highly dissected Ozark terrain. Our solution involves defining catchments in relation to estimated travel costs, where costs accumulate in relation to incremental increases in the slope angle of the ground. Put simply, it is more difficult or “costly” to travel up (or down) a steep slope than it is to travel across flat land. In Figure 2 we show 1-, 3-, and 5-km catchment areas surrounding three representative sites from different stream valley settings (see also Table 1). These catchments yield fairly consistent estimates of the availability of local wood supplies: the 1-km catchments contain less than four years’ supply, the 3-km catchments expand the supply to one or two decades, and the 5-km catchments contain timber sufficient to meet demands for roughly four decades, or about two generations. We are not suggesting, of course, that Native Americans in the Lee Creek Valley clear-cut 38 acres of timberland per year. More likely, they harvested some trees to acquire building timbers and wood for other manufacturing purposes (i.e., dugouts), collected deadwood to use as fuel, and culled both young and old trees from nut tree groves to increase the room for crown breadth development of productive middle-aged trees. The immediate result of these activities was thinning of local tree stands, but over several years cleared areas likely developed, especially in bottomlands surrounding larger settlements. The number and distribution of village sites in our study area probably represents a series of generational relocations prompted by exhaustion of local wood supplies within adjacent catchment areas. 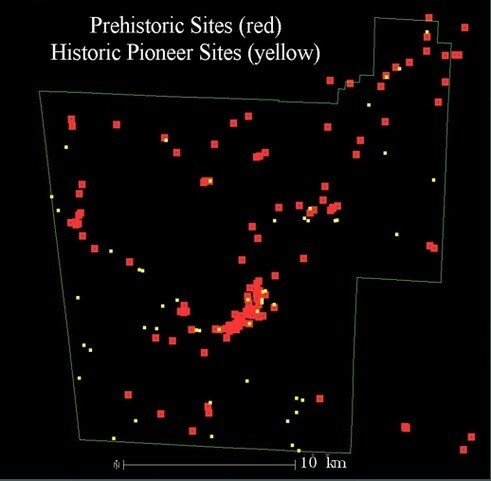 The distribution of these sites, in addition to the 4000-year time span represented, further suggests a cyclical pattern of movement in which abandoned sites were reoccupied following forest regrowth. What about land needs for food production? Under a hunting, gathering, and gardening economy, requirements for cleared land would be modest; a figure of 0.25 acres per person per year, or about one-half the amount of land required for field agriculture, may be a reasonable approximation. At this amount our 250-person community might require as much as 62.5 acres of garden space. With the emergence of more intensive field agriculture, cleared land requirements increased to something on the order of 0.5 acres per person per year. This produced an overall requirement for as much as 125 acres of croplands, coupled with an increased rate of soil exhaustion. Figure 3. Late prehistoric Native American sites (red squares) and early historic Euroamerican sites (yellow circles) in the Lee Creek Unit. To determine annual requirements for cleared land, we also need to consider the effects of field rotation. We can never be certain about prehistoric rotation cycles; however, many Southeastern and Southern Plains Indians shifted to new fields after old ones had been used for about five years (Moore 1987:143–44; Silver 1990:50–51). If one of every five fields were rotated in this manner in any given year, then old fields would have at least a 25-year recovery period—a time interval during which trees would grow to about the right size for use in dwelling construction but would not have grown so large that they would be difficult to remove (Silver 1990:50). At this rate, annual field expansion requirements would range from roughly 12.5 acres (gardening) to 25 acres (agriculture) per year. The annual requirement for newly cleared lands for either gardening or field agriculture would fall well within the annual amounts of land from which firewood was collected. In sum, these estimates suggest that firewood collecting by the late prehistoric occupants of the Lee Creek Valley produced the single most extensive impact on local forest resources. Garden and agricultural field production were most likely embedded within areas cleared as a result of timber harvest and firewood collecting. The calculated catchment areas suggest that wood supplies were obtained from bottomlands, terraces, and adjacent hill slopes. Over several generations, a community of 250 persons would have cleared extensive tracts of bottomlands in an area the size of the Lee Creek Unit, even with cyclical return to favored sites. Patterns of land use reconstructed here suggest that Euroamerican settlers entered Ozark forests that were already extensively modified by Native Americans who had been living in the region for many thousands of years. Plotting the locations of the first white settlements on a map along with the late prehistoric sites provides additional support for this suggestion (Figure 3). The major implication of this study is that long-term dynamics of forest ecosystems are best understood when all human populations are included as components of those systems. 1814 Views of Louisiana; together with a journal of a voyage up the Missouri River, in 1811. Cramer, Spear, and Eichbaum, Pittsburgh. 1991 Tree and non-tree dimensions of an old-growth shortleaf pine stand: Lake Winona research natural area. In Restoration of old growth forests in the interior highlands of Arkansas and Oklahoma, edited by D. Henderson and L. D. Hedrick, pp. 147–152. Ouachita National Forest and Winrock International Institute for Agricultural Development. 1919 The use of wood for fuel. U.S. Department of Agriculture Bulletin No. 753, Washington, D.C.
2002 Dynamics of an anthropogenic fire regime. Ecosystems 5(5):472–486. 1997 From surveyor’s chains to satellites: a study of historical environmental change and land use on the Lee Creek Unit of the Ozark National Forest, Crawford and Washington Counties, Arkansas. Arkansas Archeological Survey Project 955 Final Report. 1963 Domestic fuel in primitive society. Journal of the Royal Anthropological Institute of Great Britain and Ireland 93:186–94. 1995 The evolution of human ecosystems in the Ozark National Forest: a pilot study of the Lee Creek Unit. Arkansas Archeological Survey Project 876 Final Report. 1940 Tixier’s travels on the Osage prairies. University of Oklahoma Press, Norman. 1999 A journal of travels into the Arkansas Territory during the year 1819. University of Arkansas Press, Fayetteville. 1996 Rude pursuits and rugged peaks: Schoolcraft’s Ozark journal 1818-1819. University of Arkansas Press, Fayetteville. 1990 A new face on the countryside: Indians, colonists, and slaves in south Atlantic forests, 1500-1800. Cambridge University Press, Cambridge.